Reed & Barton ~ Country French ~ 3-Piece Serving Set, Price $60.00 in New York, NY from William-Wayne & Co. 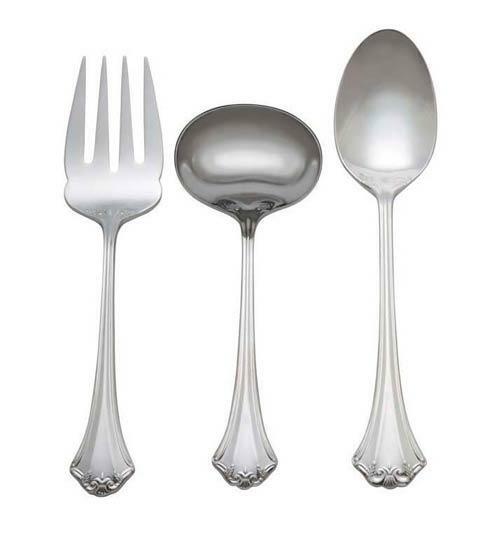 The refined design of the Country French fine stainless flatware pattern from Reed & Barton will bring the charm of the French countryside into your dining room. Modestly ornate, the flared bottom and tender leaf motive give it a perfectly elegant feel. The 3-Piece Serving Set includes the Cold Meat Fork, Gravy Ladle and Tablespoon. Elegantly packaged for gift-giving.